Utmost style and comfort featuring dual open arm storage, tray table, 3 pillow waterfall back and supreme seating comfort. 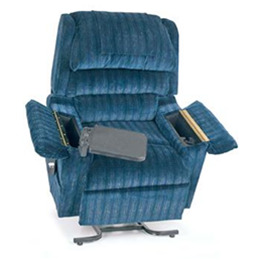 The Regal is a feature rich lift/recliner designed for people that like to keep things within hands reach. The dual flip open arms conceal extra storage space, a cup holder and hideaway tray. The luxurious three pillow waterfall back can be adjusted, providing more comfort options. It’s handsome style and superb construction will allow you to kick back and relax in first class comfort. Let Golden Technologies take all the worry out of purchasing a lift/recliner. Our expert craftsmen blend the finest components with superior designs to provide you with the utmost quality, comfort and style. We confidently stand behind all our products and provide you with the best warranties in the industry. Choose the lift/recliner that all others are measured against….choose Golden! Golden Craftsmanship: Each luxury lift & recline chair is hand crafted in our facility using decades of motion furniture experience. Added Comfort and Safety: Designed to perform year after year using advanced technology backed by the best warranty. Smart Engineering: Smooth, quiet lifting system offers a secure lift for the best performance. Smart Tek: Our luxury lift & recliners are equipped with electronics able to assure a secure lift every time you need it.